Welcome to Chichester Fencing Club! Chichester Fencing Club provides fun fencing and coaching for beginners and more experienced fencers of all ages. There are two separate sessions for juniors and for adults. Members of the club fence all three weapons. Kit is provided for those who do not have their own. In fact the club has just purchased a large amount of brand new equipment with money from a substantial Lottery grant. The club runs group coaching sessions with a friendly, encouraging atmosphere. Everyone is welcome, including people with a disability who have the opportunity to train with level two coach and former GB champion Viv Mills. Chichester Fencing Club visits local schools to try to encourage young people to take up the sport and, of course, we are always glad to have new adult members, either beginners or more experienced fencers. 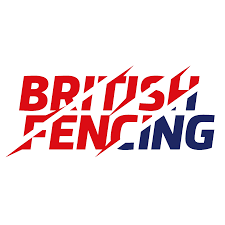 There is also information about regional and open competitions available for the more competitive fencers. 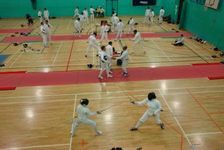 The club also organises regular events such as fun junior competitions, inter-club matches, beginner courses, and demonstrations from Britain's top fencers, as well as many others. The club meets once a week in Chichester with fees being paid on a day to day basis, or up front for a whole term, which turns out slightly cheaper. For more information see When & Where. Fencing is a fun, energetic sport that has been popular throughout history. It is very action packed and full of variety. The atmosphere at the club is very friendly and everyone welcomes new faces. Fencing is a very sociable sport and it is easy to make friends, both from the club and competitions. Fencing helps to keep you fit by improving your stamina, reflexes and strength. It is a sport that demands not only physical strength but also intelligence. It is all about figuring out how your opponent thinks. Fencing is engaging and fulfilling, providing many advantages to both young and old, beginners and more advanced fencers. It requires discipline and adaptation, while still remaining fun throughout. If you have never tried fencing before and would like to give it a go, our adult beginners' courses could be perfect for you. In the past our courses have been very successful, with many beginners deciding to continue with fencing after completing their course. The courses include an overview of the rules of fencing, footwork and blade-work lessons, a chance to try out all three weapons and the electric scoring equipment, and a friendly competition with prizes to finish the course. All this is supervised by Chichester Fencing Club's award winning coach, Sharon Blackman. Don't worry if you've missed one because Chichester Fencing Club will continue to run courses throughout the year as well as welcoming new people to any session.